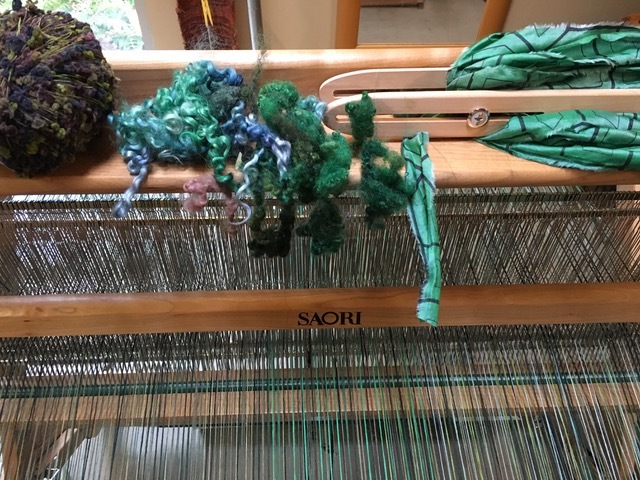 I had been to Terri’s SAORI studio in the woods on three separate occasions before this trip and I thought this would just be a longer version of those experiences. 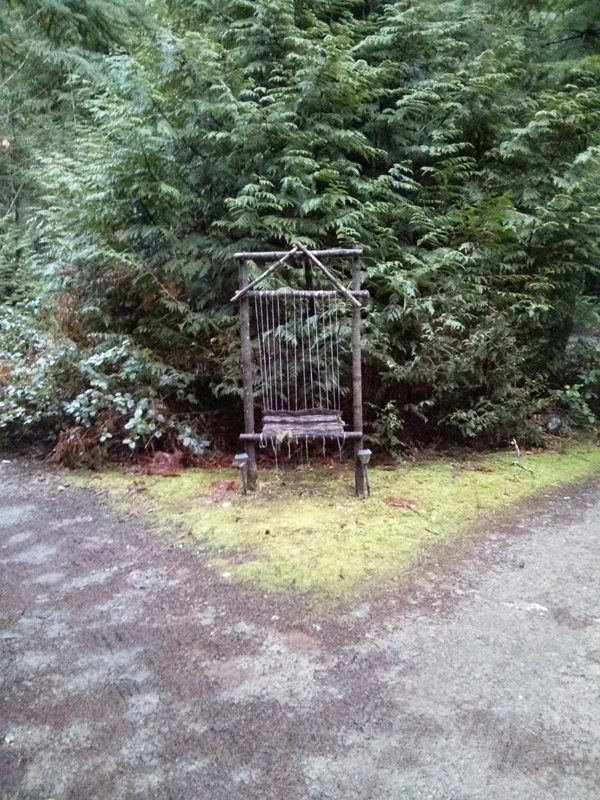 I didn’t realize that this Artist In Residency was going to be different in so many ways. 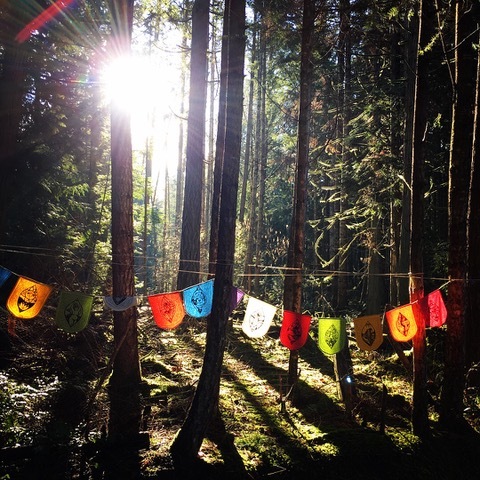 It turned out to be not only the creative experience I was craving, but also an emotional and spiritual experience as well. I promised myself that I would not have any goals or pre-meditated outcomes and that I would just “go with the flow”. 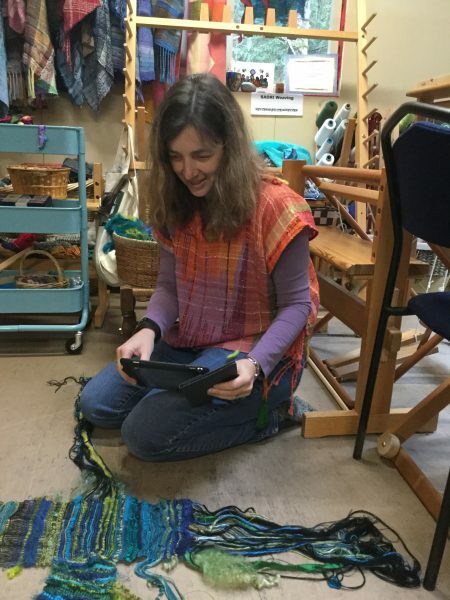 I was committed to just living in the moment, and allowing myself to weave what was inspiring me, which ended up being about weaving the landscape of the island. 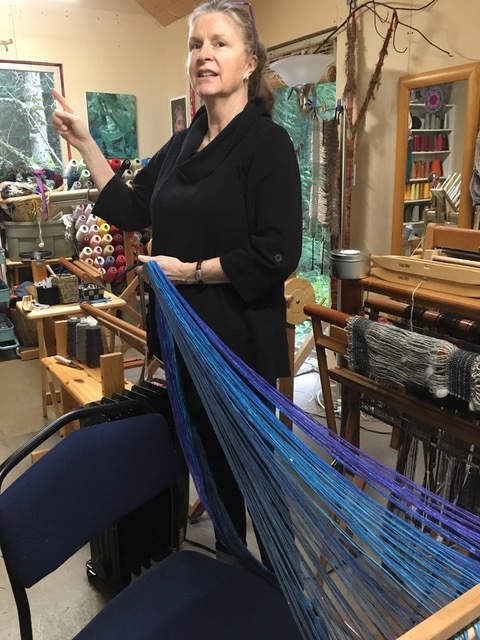 Terri and I usually met in the studio in the mornings – and I would ask for guidance with different techniques I was interested in learning as well as feeling more comfortable with Kenzo’s table top warping technique. Terri is so wonderful at just allowing things to bubble to the surface and she was there to help with whatever I asked. 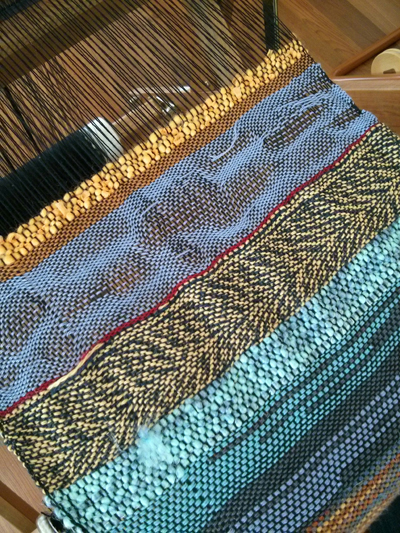 I ended up weaving the landscape of the island, working in colours that I generally am not drawn to in shades of the sky/trees/rocky beaches; greens/blues/steel greys and brown hues. I napped and walked in the afternoon, or I went to town and strolled through the shops and art galleries. 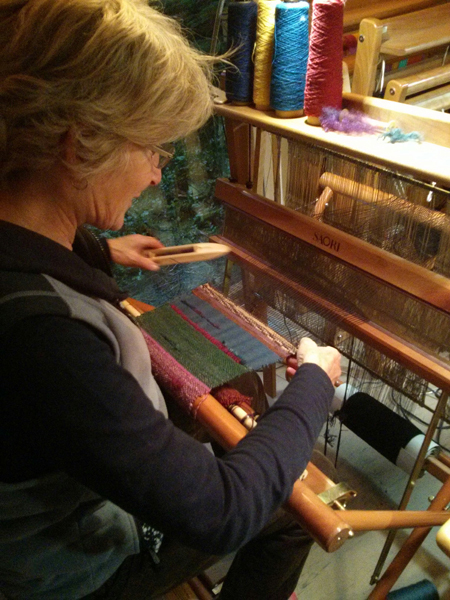 In the evenings I wove on a loom Terri had put in my room – that had a a white warp with large gaps in the threading. Some evenings, I would pad over to the studio and weave or I would flip through her pattern books until I was ready for bed. 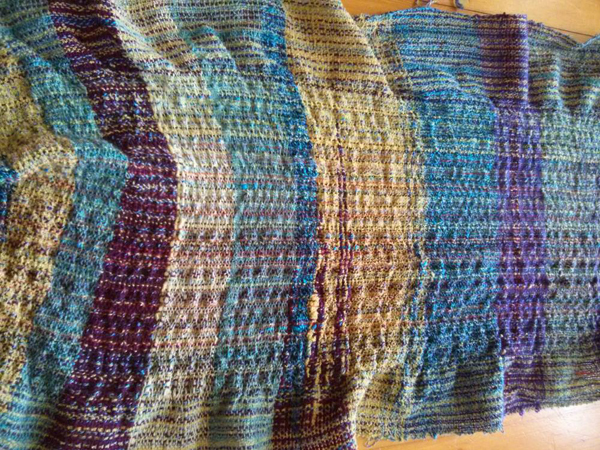 I found myself re-reading the Self Innovation Through Free Weaving (The Purple Book) and specifically the parts about Misao Jo’s journey into SAORI weaving and how she intuitively just let her weaving unfold. It reminded me that SAORI is about weaving to find our true selves and we end up with a unique and personal piece of weaving as a bonus at the end. With the passing of Misao Jo in January – these words felt even more poignant and profound. Like many women I know, I have struggled with perfectionism and the need to be “striving”. If I’m not working towards a goal, then what is the point? 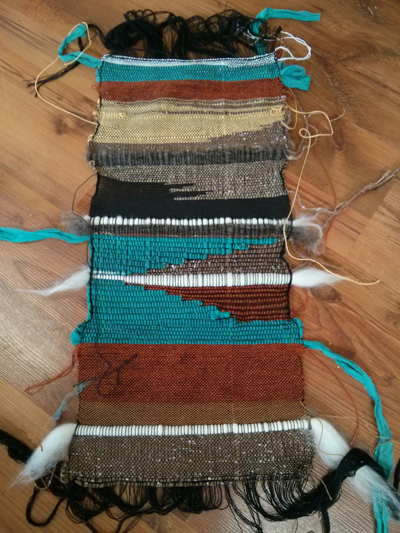 These thoughts still end up being front and centre when I am starting my weaving. 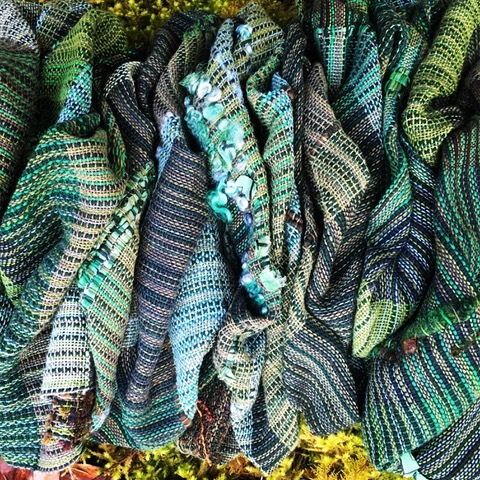 I think “what is this going to be?”, “will I ever even wear this colour?”, “what if it’s ugly and I’ve wasted all those materials?”. These thoughts can paralyze my creative spirit. This week was all about accepting that I didn’t need to have any answers to those questions – and that I could just let go and weave what I was feeling without worrying about the end product. 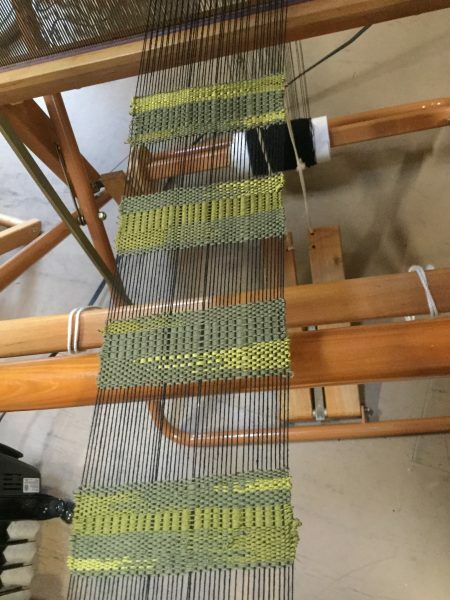 This proved to be surprisingly uncomfortable at times, but in the end I was able to find a flow and joy in my weaving and I ended up loving, and feeling connected to the finished cloth. Another gift of the week was Lynn Jones coming to spend the day with us on Monday. 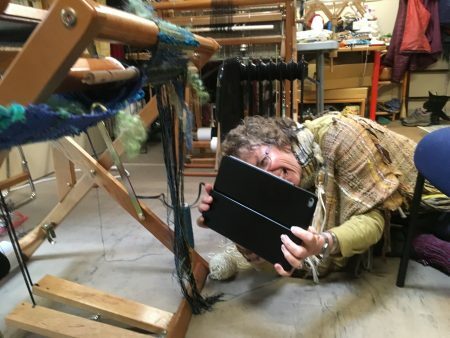 She has been SAORI weaving for almost a decade and she loves the process of sewing her woven pieces into clothing, and helping others “see” their cloth in the light of “what does it want to be”? 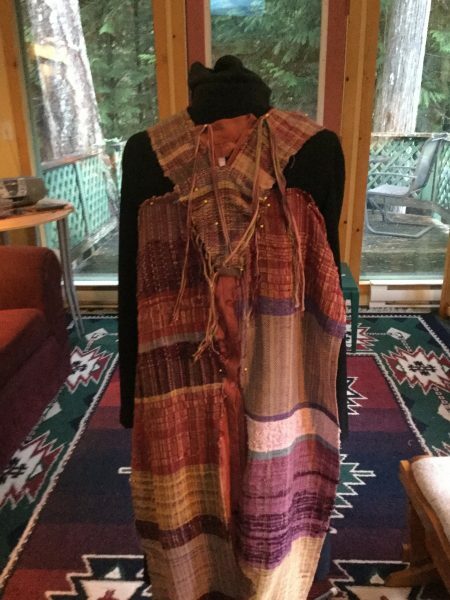 She brought a suitcase stuffed full of her SAORI woven clothing pieces and I excitedly tried on each one, loving each one even more than the one before. It was so inspirational! 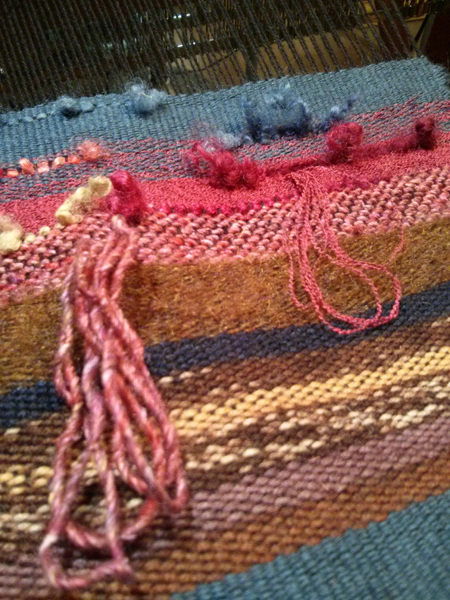 We spent the afternoon draping samples of woven cloth I had brought with me in ways I had never thought of or envisioned. Terri & Lynn together are a force! All of a sudden, I just wanted to sew, and for anyone who knows me, I never thought I would ever say those words! 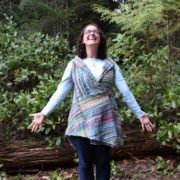 I made a short top and two vests while I was there and I love them all. I even wore one to a meeting in downtown Calgary last week which was a huge leap for me! 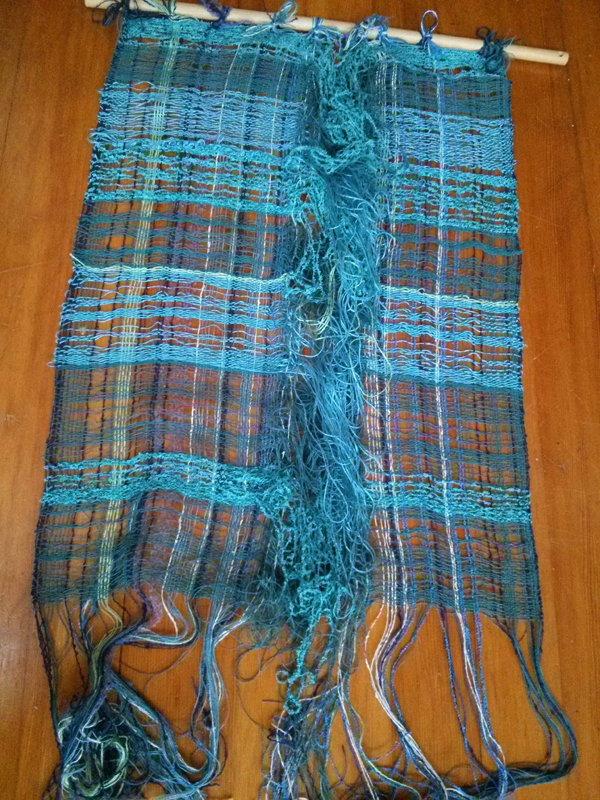 I have a new confidence as well as an exciting and fresh perspective regarding my woven cloth. 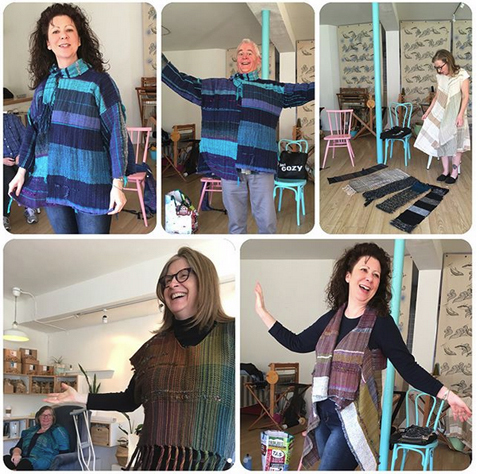 We closed up my week with a SAORI Kai at Poppet Creative, Terri’s satellite studio in Victoria. 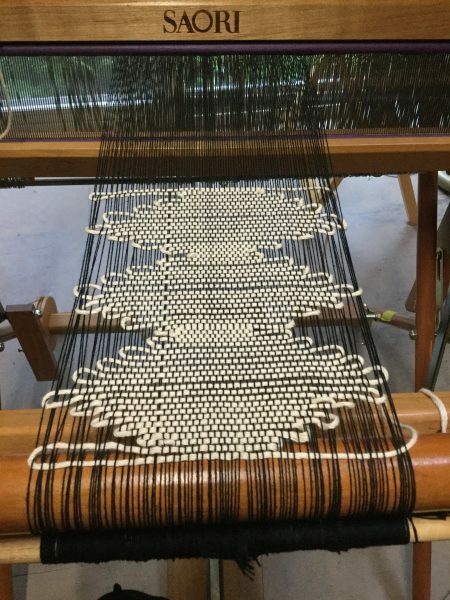 I was able to meet all the lovely SAORI weavers that make up this community, and it was such a treat to not only share my work, but to see what other people have been weaving and making with their cloth as well. I loved being a part of such a welcoming group, even if it was just for the day. discovering coconut milk yogurt (so yummy!) and having long uninterrupted naps without laundry, grocery lists or voicemails that needed to be returned. But it also opened up my creative spirit to the question “what if”?. What if I added locks? What if I left a big space on this row? What if I added a completely different colour than I’m currently using? What if I let the edges go loose and create loops? Going into the AIR, I still had so much fear of making a mistake. Then something shifted and I came away with the realization that so many possibilities open up when I just allow myself to ask “what if”? 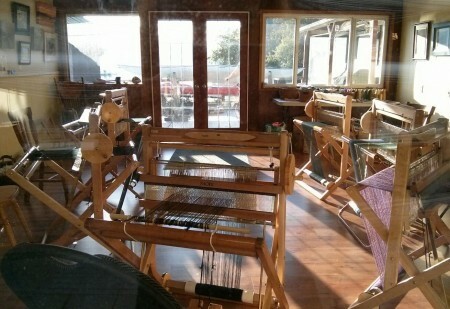 And not just in weaving! 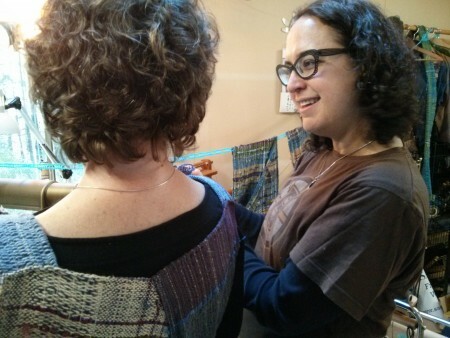 A sincere thank you to Terri, who opens up her studio and her heart to make these retreats possible. 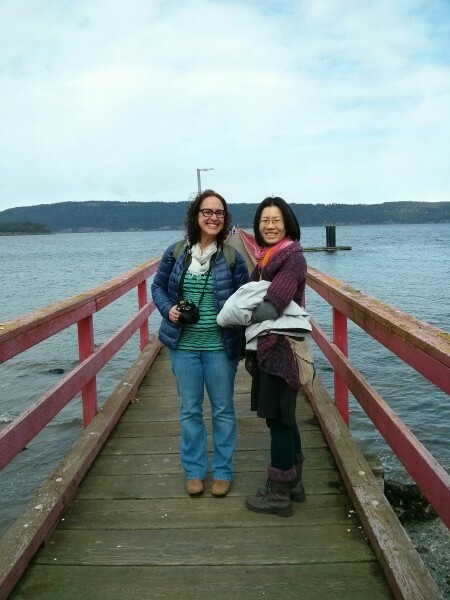 I feel so grateful that she and her SAORI teachings have made their way into my life and my heart. 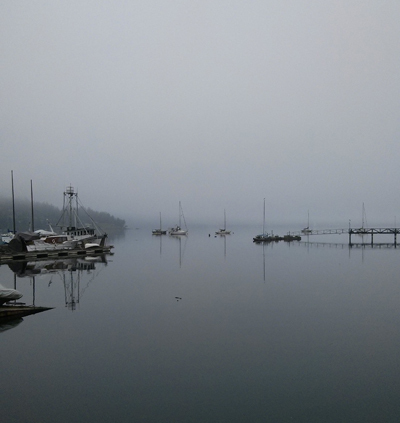 I was delighted to be the Artist in Residence at SAORI Salt Spring for 3 1/2 days this month. 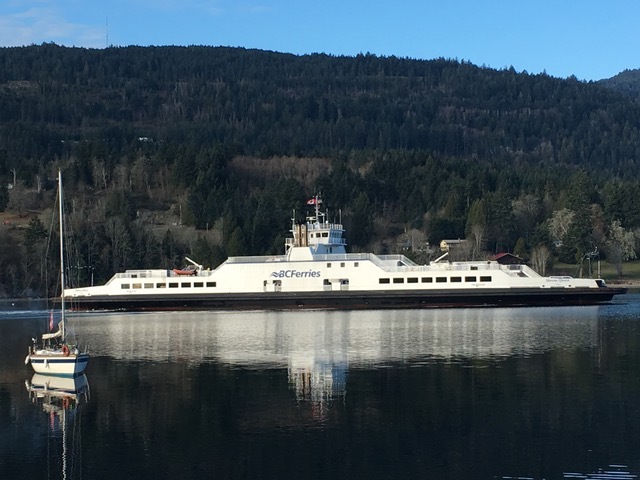 The deciding factor for me was ‘weaving on Salt Spring Island without distraction’! I have a very full life at home. Both of my sons are living with me right now, my hubby, Bob and my (getting very old and grumpy) dog, Wilma. Though I have a ‘studio space’, it is shared. With musical instruments and a family computer and lately, some silver smithing / jewelry making tools. I love the busyness of it all, but it does impede the creative process for me. One thing that I took away from my time on SSI is that I’m best really early in the morning. Always knew that, but never really put it to creative use. So, from this time forward and forever more, I will use the time from waking til 9:00 am to be creative, alone, with my cloth and my babe (draping, shaping, cutting and sewing). 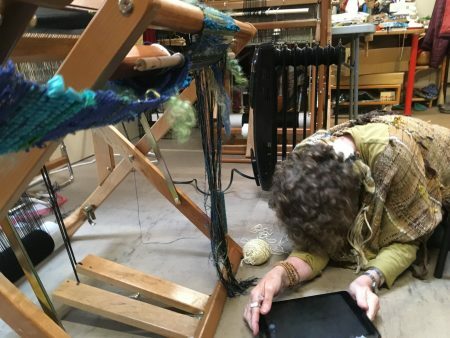 I can weave with everyone around, but I can’t improvise with my cloth unless I have some peace and quiet. 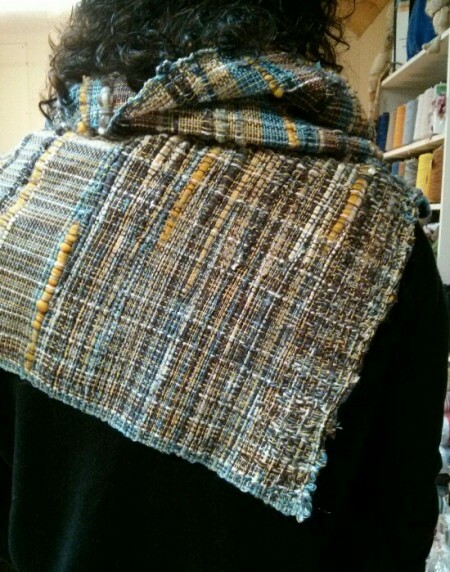 So, I had time to create…2 pieces I’d woven earlier. 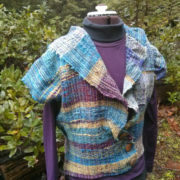 A jacket in blues with blue jean sleeves and a tunic woven with fabric from some thrift store finds. 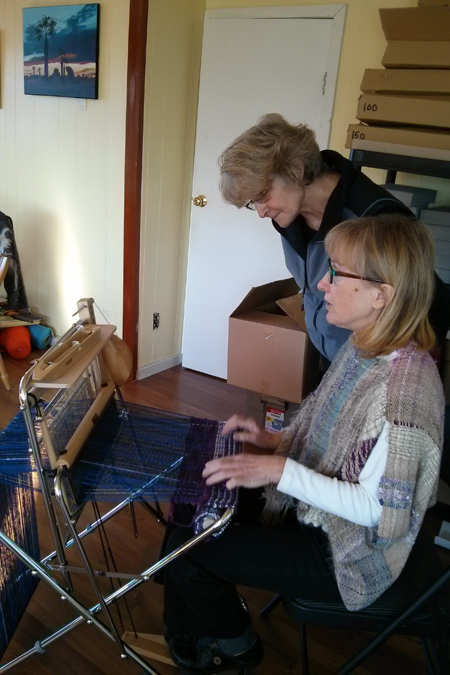 The other amazing experience I had with Terri was the time to collaborate on a weaving. 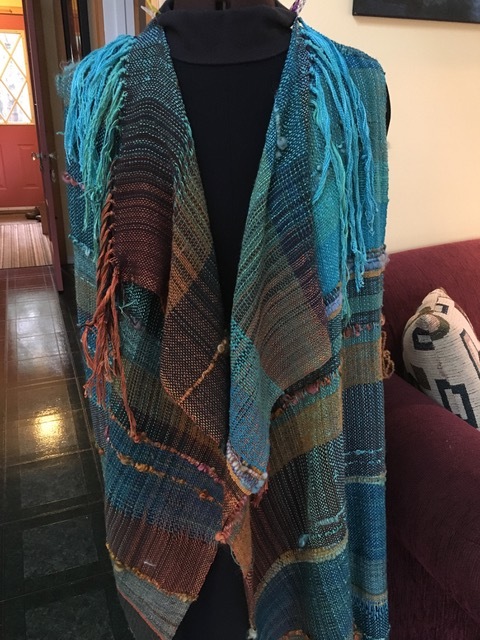 I had ‘scored’ some thrift store silk. 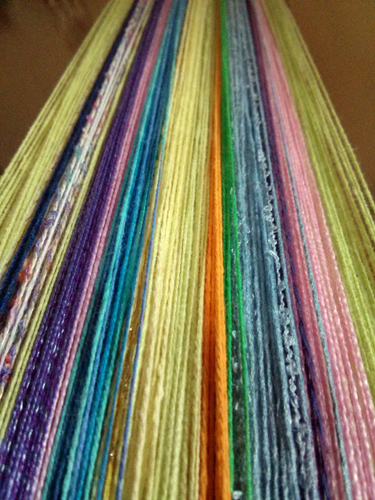 75% off beautiful blue, green, pale yellow, mustard and white silk threads! This was our inspiration. 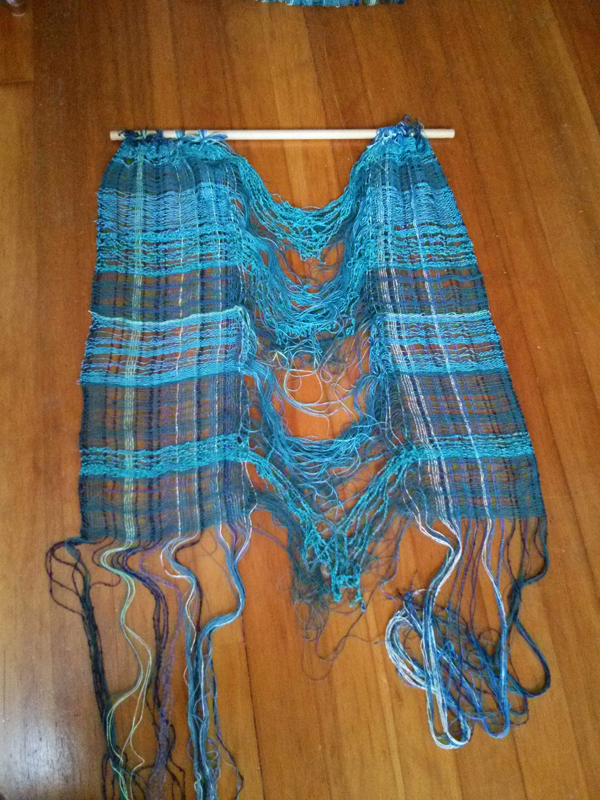 Though I had a plan for the weaving, it became something completely other! 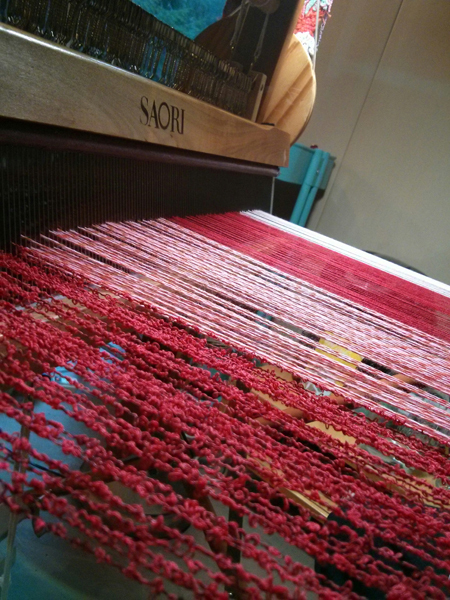 SAORI philosophy tells us to listen to the cloth, not to plan ahead of time, to weave ourselves. So, the plan I had will materialize on some other visit. 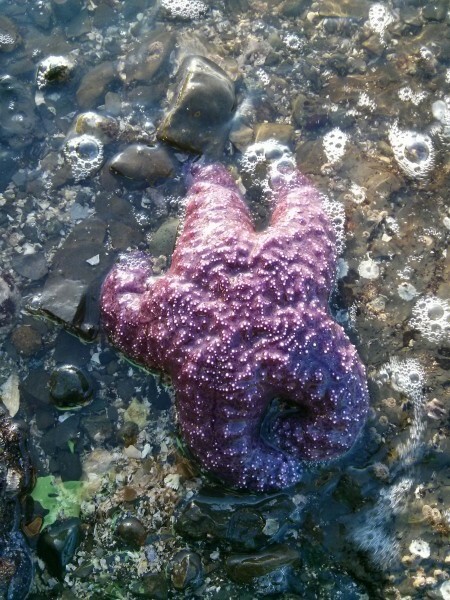 What Terri and I created was a kelp bed, unintentionally of course . 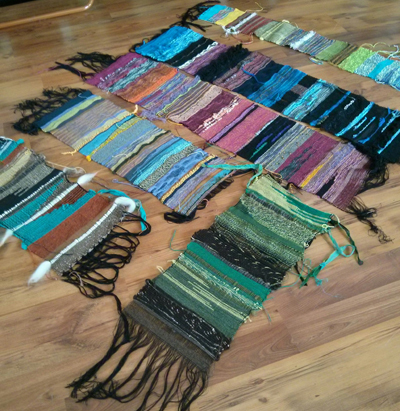 The whole weaving was shared…every piece that went into it, every idea, all the threads. As Terri so beautifully put it, there were no egos. We threw ideas back and forth. 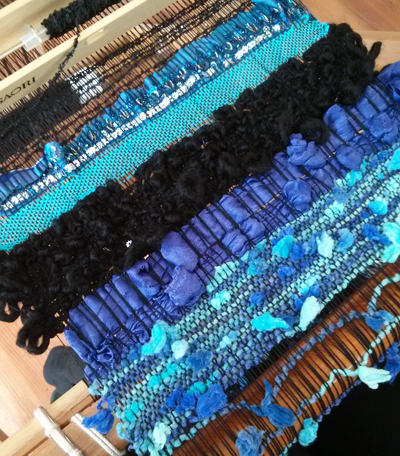 We have so many more ideas to put into our future weavings! 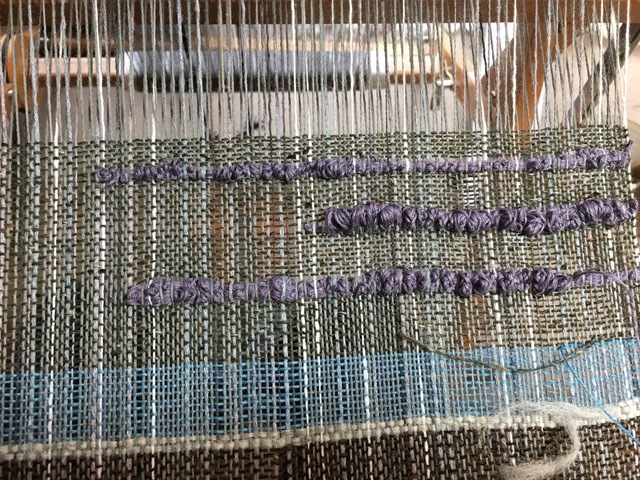 It was just as much fun weaving as it was photographing the experience. We had to keep reminding each other to take pictures….. And sometimes we just got silly! I had time to create in the cottage. To cook for Terri and Alan. To sip wine and listen to music. Carole King’s Tapestry was my go to cd. How appropriate!!! I am so very grateful for the experience of being the AiR. 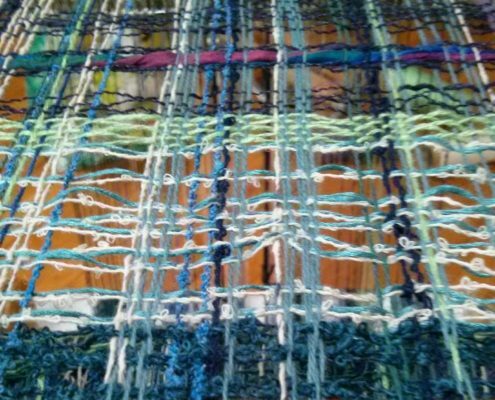 Looking forward to annual WOWWWs (weeks of weaving, wondering and wandering) and whatever else comes from my journey into SAORI weaving and it’s never ending possibilities. How appropriate for me to read this while being the AiR. I had a great time with Lynn. 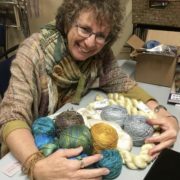 It was fabulous to collaborate and explore together – so many ideas! Or you can find me more often on Facebook or Instagram. 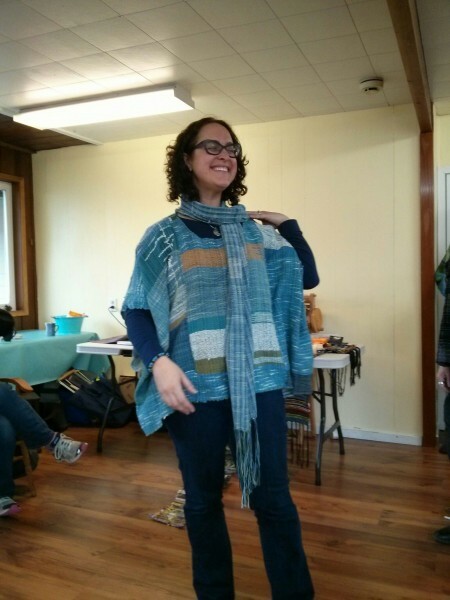 So, we set up weekend workshops and a SAORI Kai. I had a lot of feedback from people after about how much they were inspired by her presentation of her work and her process. One piece that she shared with us was something she had worked on over the period of two years. 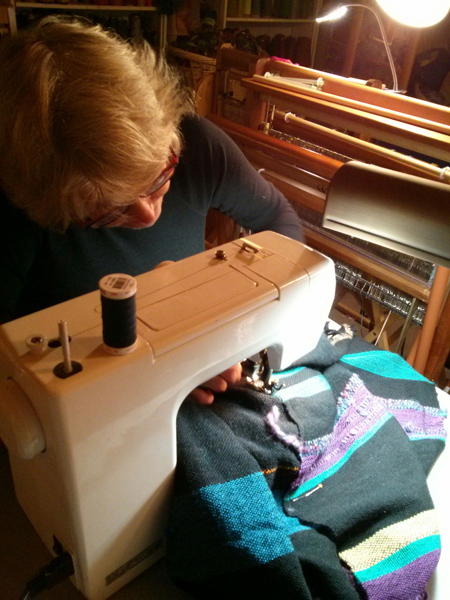 She wove a piece each month that reflected her life over that month. The following year in the same month she did more work on that same piece. 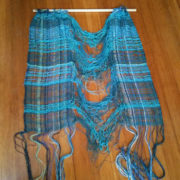 We shared with her some of our weavings and clothing design, wall hangings and pieces of cloth. It was all a wonderful start to the residency. 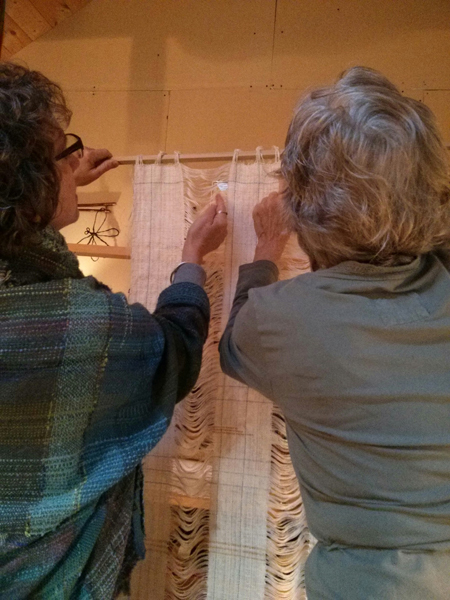 As Stacey was here, she wrote a blog post for every day – documenting the weaving, meetings with people, conversations, places we visited on the island. If you haven’t already seen them, these posts are well worth a read. Lots of photos too! Stacey worked on different pieces while she was here including one she called “Little Terri” – this piece incorporated a collection of items that I had given her at the beginning of the week. It was jewelry of mine, collected over years, that I didn’t wear anymore. 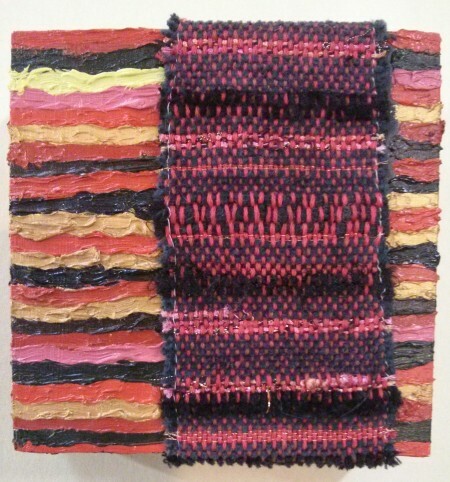 She brought me one of her works – that incorporates painting and weaving and it now hangs next to my SAORI Calendar in the studio. We enjoyed the days, the visitors to the studio and the island…the days went by way too quickly! 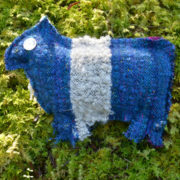 My website: www.saorisaltspring.com, see some updates on my Gallery page here. 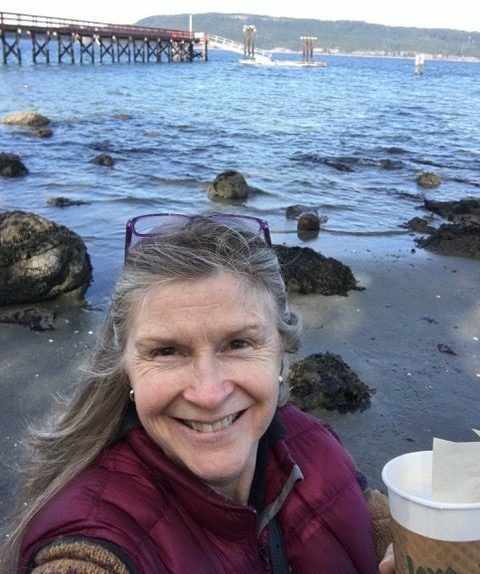 For a year now, I’ve been teaching workshops at the beautiful Pacifica Paddle location in Brentwood Bay on Vancouver Island. 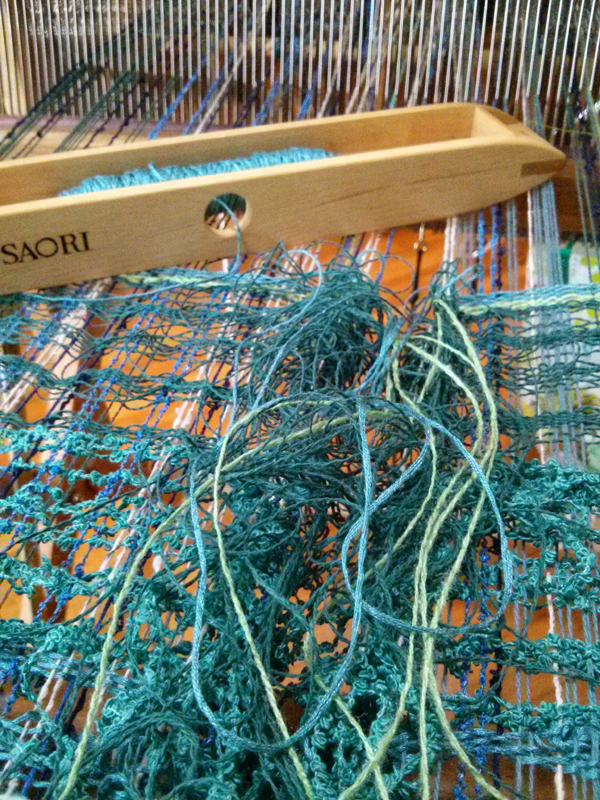 It is so wonderful to have my looms and supplies there at a ‘satellite studio’ and just come over on the ferry to share SAORI weaving. Here is a sampling from this weekend. 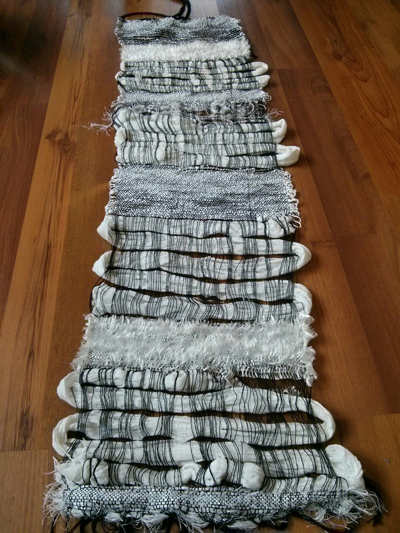 One of the first weavings was in all whites. Stunning! Then more colour, a lot more colour, crept into the next one. 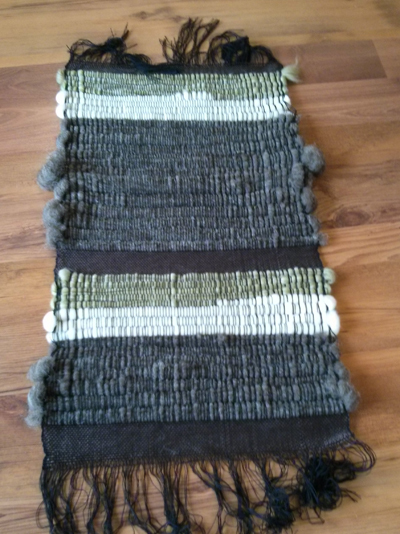 Some rugs were woven with local wool and alpaca roving. This one for a lucky kitty! 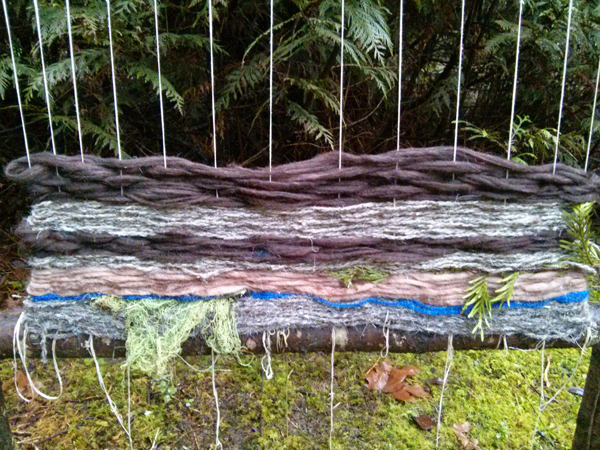 And lots of colour and texture. 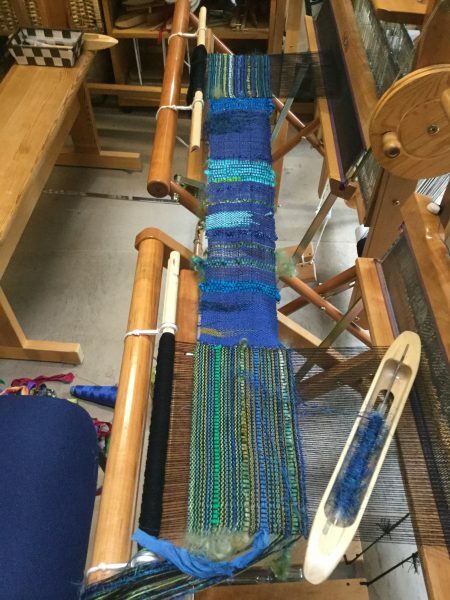 Marilee was learning to make warps with Kenzo’s new warping tools. 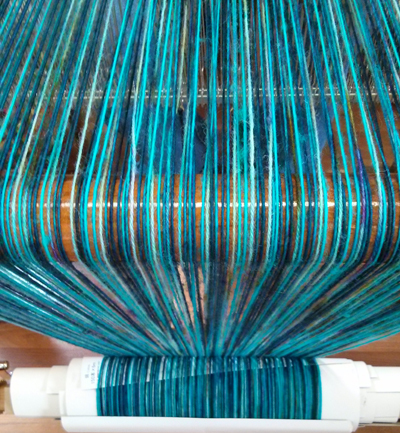 It’s kind of like making your own pre-wound warp. Quick and easy to do – and it can all be beamed and threaded right at the table. 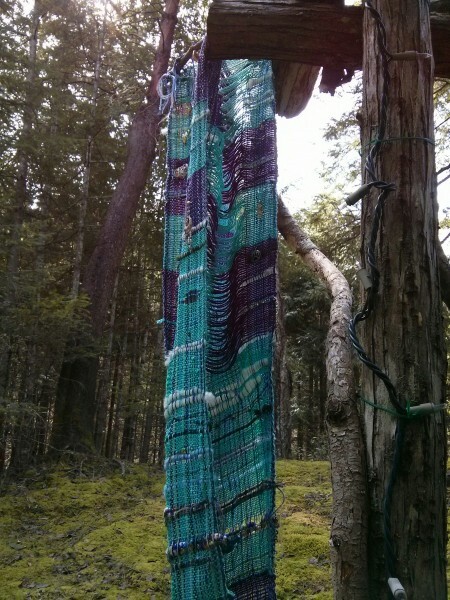 Or you can use the loom. 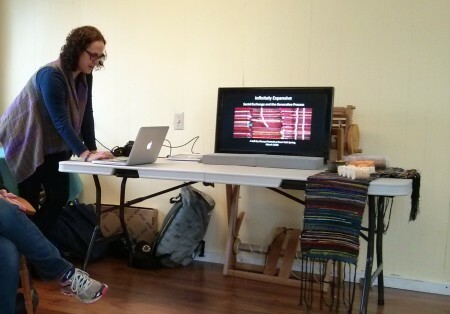 Thanks to Peter & Sandra for making these workshops possible at their workshop location. And to all who come out. 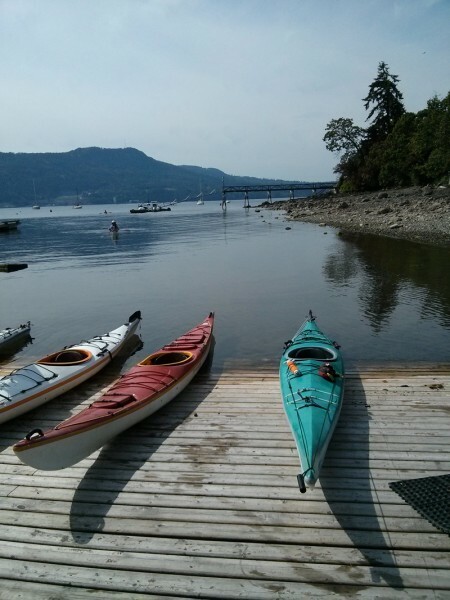 You can always go out for a paddle while you are there – or bring a partner or friend who would like to get out on the water. 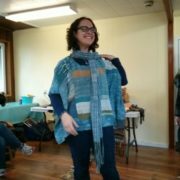 Next month there is a workshop on Saturday, March 12 from 10-3 and then a mini-workshop on Sunday, March 13 from 10-12. 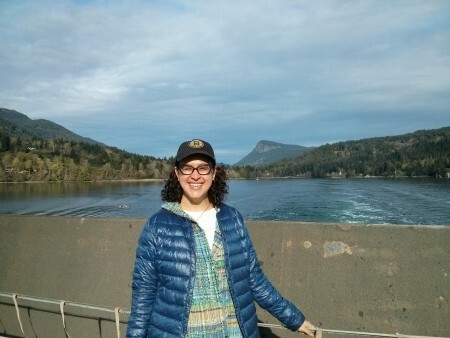 We will be joined by a special guest – Stacey Piwinski from Boston – who will be the Artist-in-Residence at SAORI Salt Spring that week! Come and meet Stacey and see some of her works from her recent exhibit. PLUS a SAORI Kai on Sunday, March 13 from 1-3. Please come out, bring your weaving, your questions and share in the joy of SAORI. All are welcome. 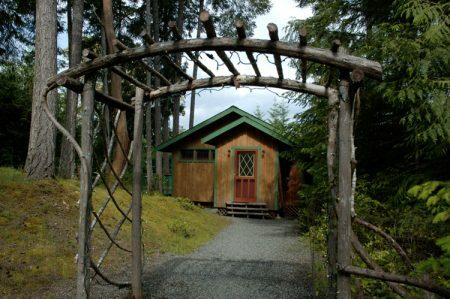 I am pleased to announce the next Artist-in-Residence at SAORI Salt Spring. And I want to thank all the others that applied…the decision was not an easy one! 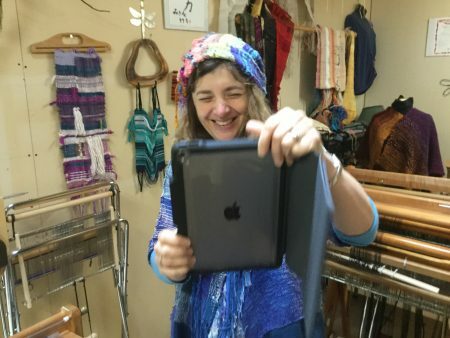 I have met some of her connections to SAORI – Mihoko Wakabayashi of SAORI Worcester and Bobbie Herron – and I look forward to meeting her soon. 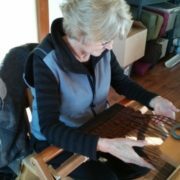 She will be here in March and coming to the workshop days and SAORI Kai at Pacifica Paddle on March 12 & 13. I would like to continue my abstract woven portraiture work, but this time instead of working with friends, I would be making new friends in new places. 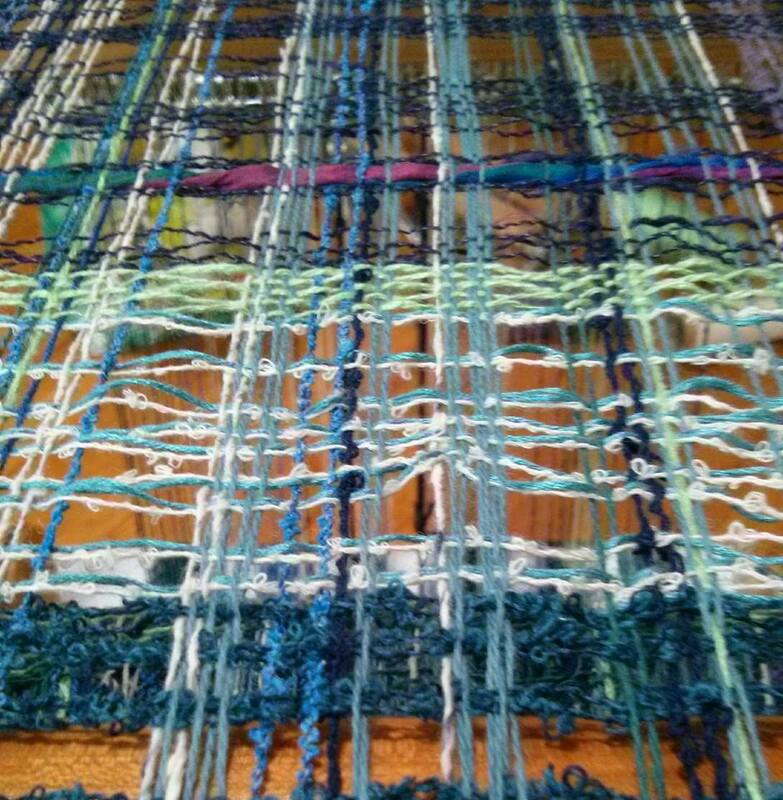 I have no idea where this new work will take me, but I am excited, a little scared, and willing to find out my getting my hands in an allowing the loom to make those soothing clicking sounds and guide the conversations and the fabric row by row. 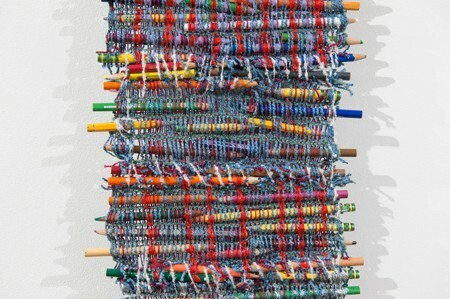 Although her work speaks to painterly concerns, Stacey Piwinski (CFA’99,’00) uses textiles and found materials to create intricate weavings that consider the passage of time, the tactility of material, and interpersonal relationships. 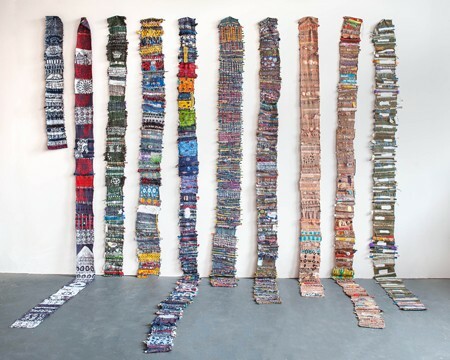 In her fabric scrolls and mixed media works, Piwinski carefully re-contextualizes objects that have personal significance or simply have been left behind. In these material and personal explorations of memory, Piwinski allows the objects to weave together new meanings and to tell new stories. 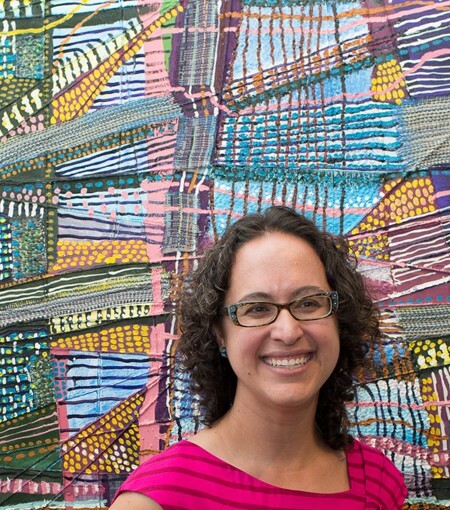 Stacey received her BFA in painting in 1999, her MFA in studio teaching in 2000 from Boston University, and most recently her MFA in visual arts from Lesley University in January 2014. 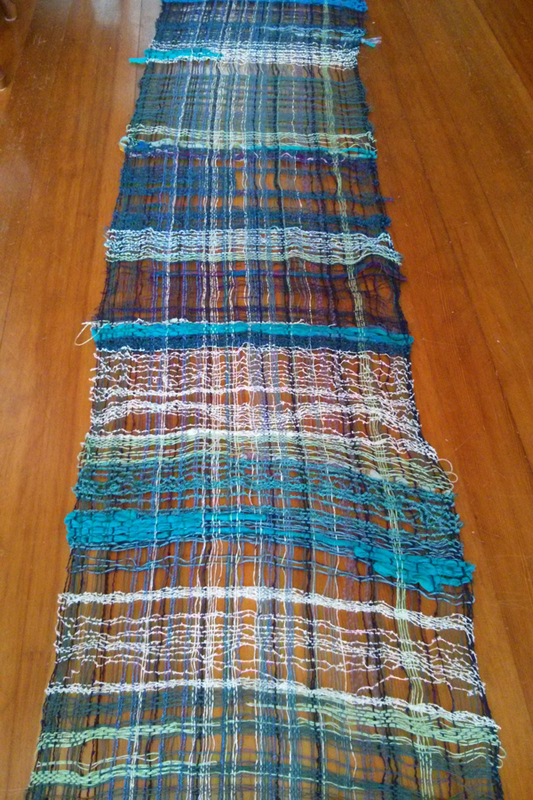 Stacey participated in the Japan Fulbright Memorial Teaching Program in 2005 and was inspired by Japanese textiles, specifically Saori Weaving. 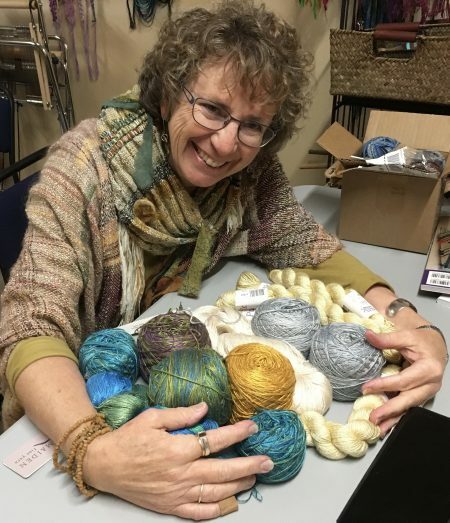 As an arts educator in the Wellesley Public Schools, she has facilitated community-weaving projects as a way of connecting individuals. 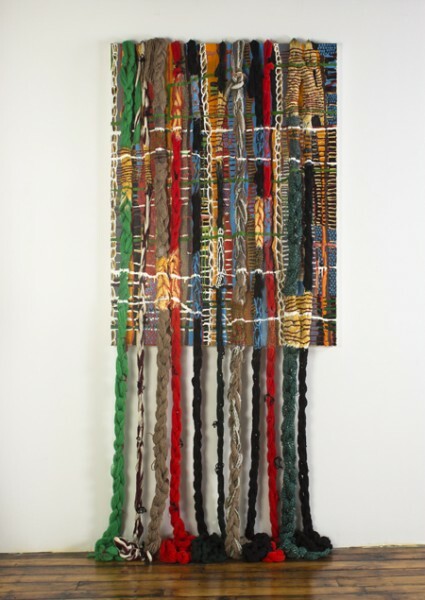 Weaving as a metaphor for bringing people together is a thread that runs through all of her work. 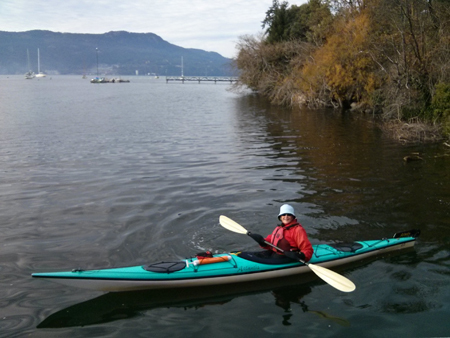 I’m looking forward to her SAORI explorations here at SAORI Salt Spring. I hope that many of you can join us for a SAORI Kai on March 13! Over the next months, I will continue to add to the weaving and invite others to as well. 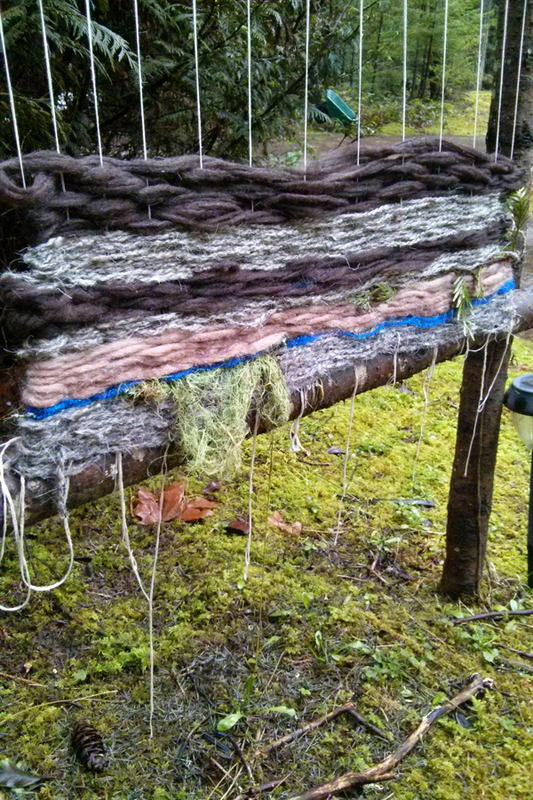 PS – Credit for the idea of my Earth Loom goes to Susan Barrett Merrill. 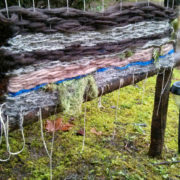 My earth loom was built in 2009 by my cousin and I thank Tony for that! Other posts about it can be found here. 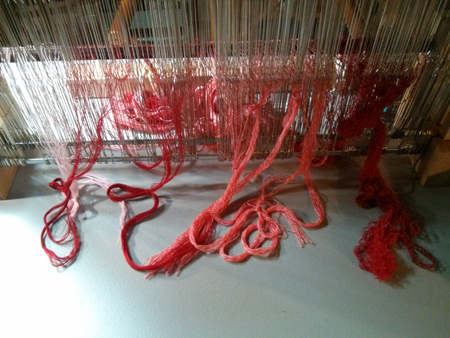 Today Tara came to the studio and we planned to make a new warp. 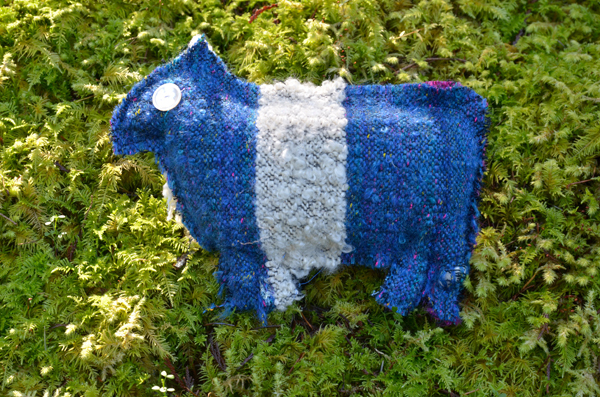 As we looked at the calendar she realized that this week is the beginning of the Year of the Sheep, so plans changed as she wanted to make a sheep to celebrate. 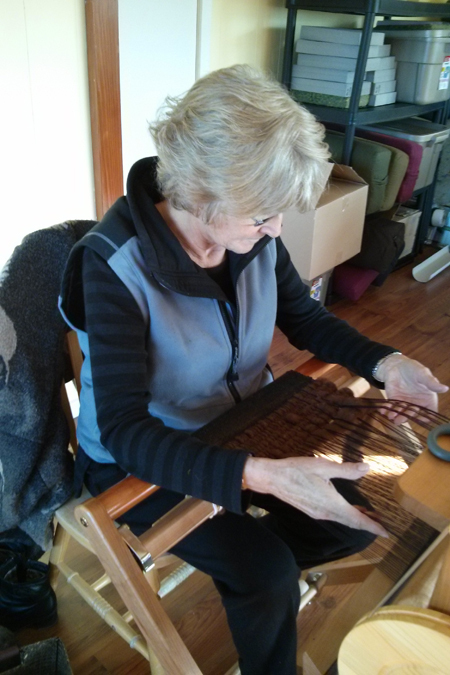 So, we found some fabric that she had woven and did just that. 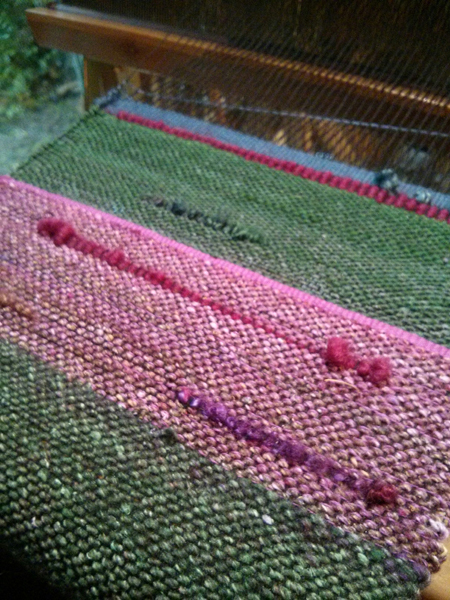 I’ve been enjoying more time to weave this last week. 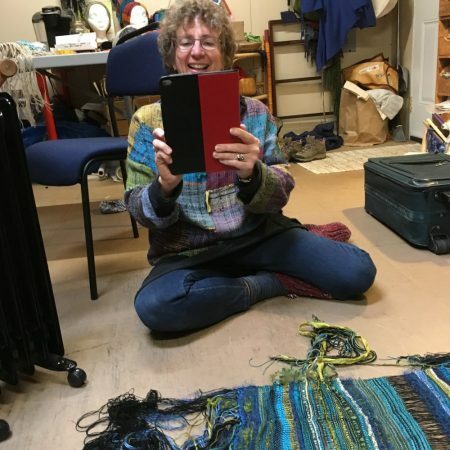 My living room has become my second studio and been filled with fibre & fun. 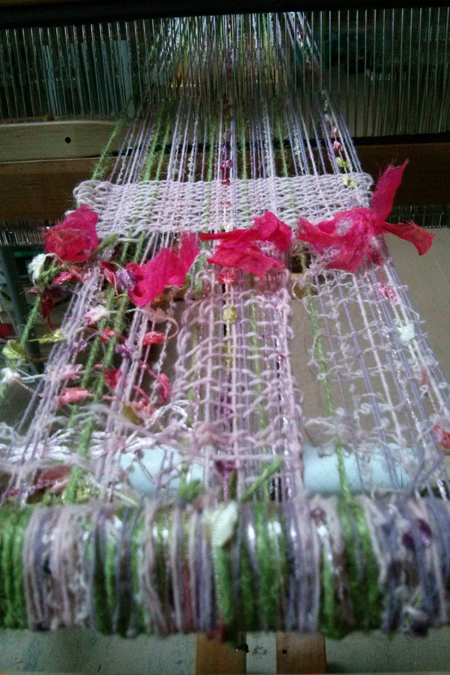 I’m happy with the result – very lacy. Not sure yet what it will become. I will be attaching this to a branch of some sort and using it as a wall hanging. 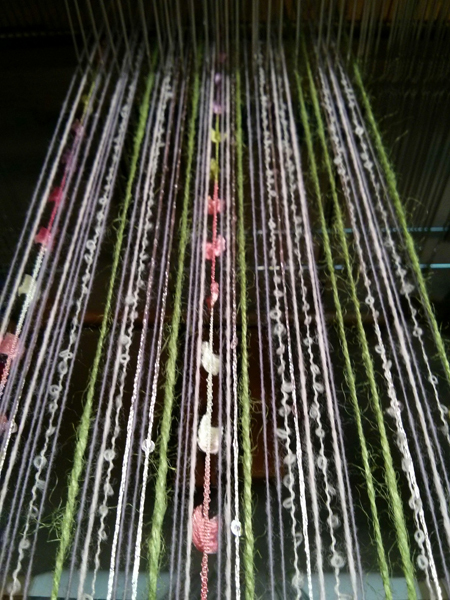 The loops will create a nice drapey bit in the centre – I just need to sort them out a wee bit. There’s more, but that will wait for another post. 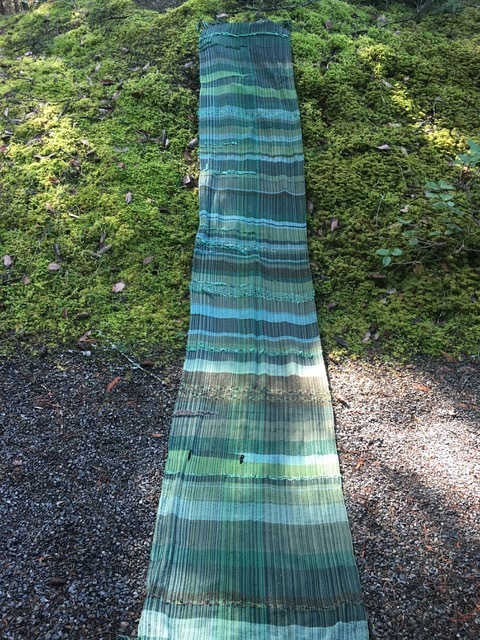 Also, I will be announcing details of an Artist in Residence opportunity for someone to come and share SAORI weaving with me here at SAORI Salt Spring this fall. 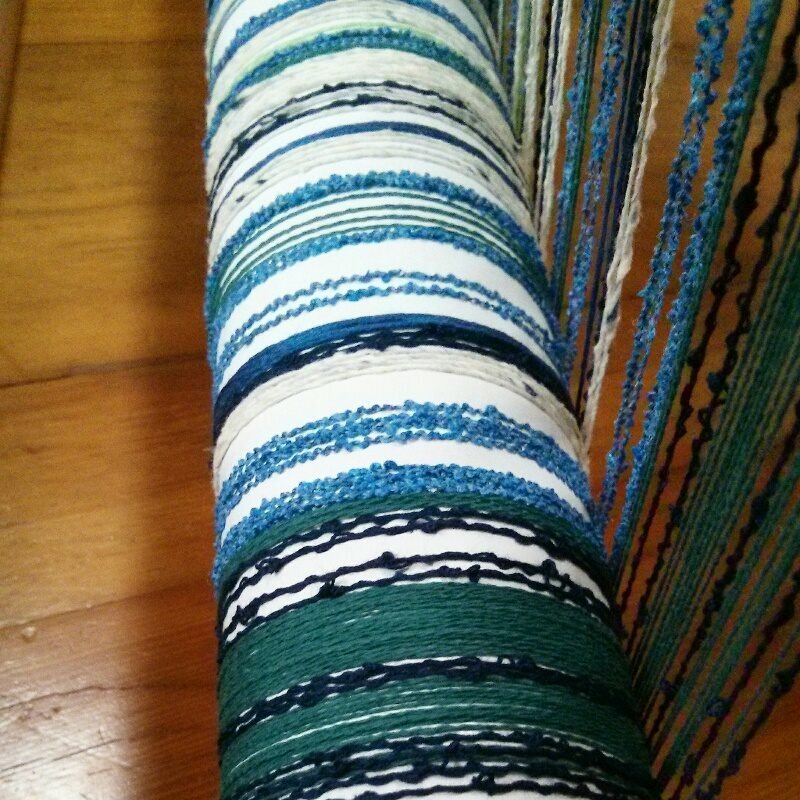 When I was in Japan last May I had a chance to try Kenzo Jo’s special stretchy yarn. 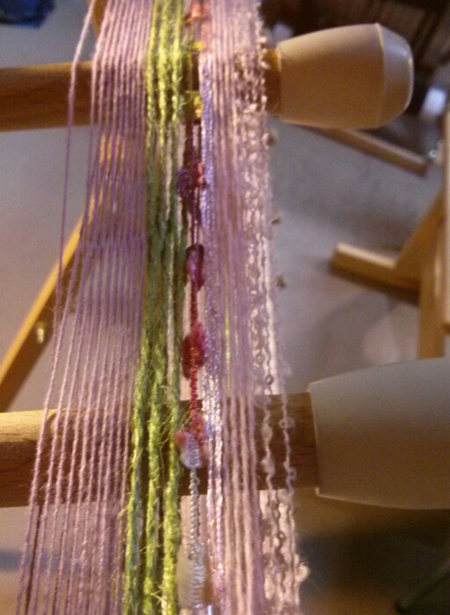 I had used stretchy yarn in the weft before, but never in the warp. 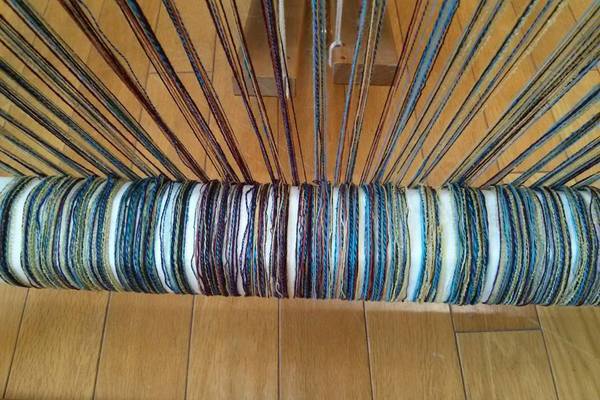 This yarn is stretched and starched so that you can wind it into a warp like any other fibre. 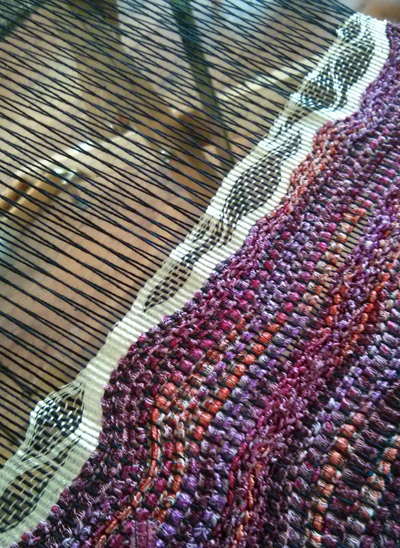 Once you wash the piece, the starch comes out and the yarn contracts making for a fabulous effect. 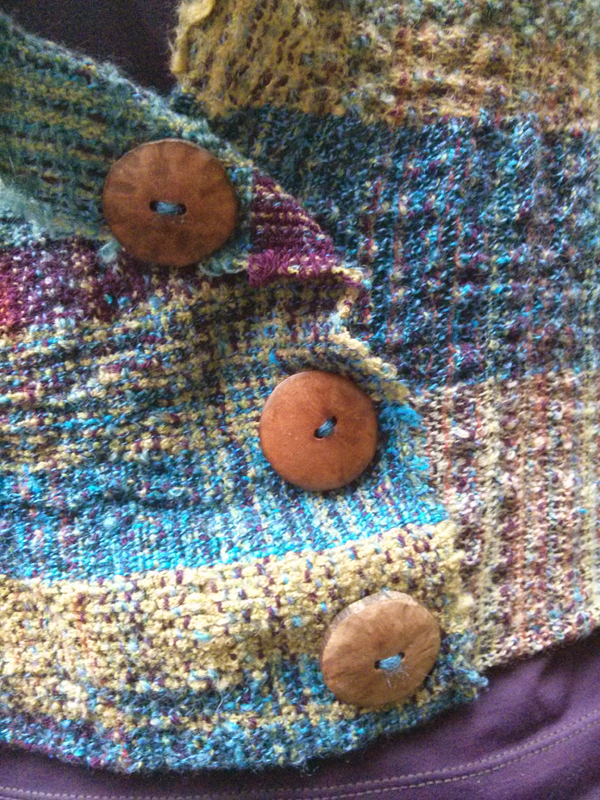 In this piece, I put this yarn every 5 (or so) threads just in the centre section. So exciting to see the changes! 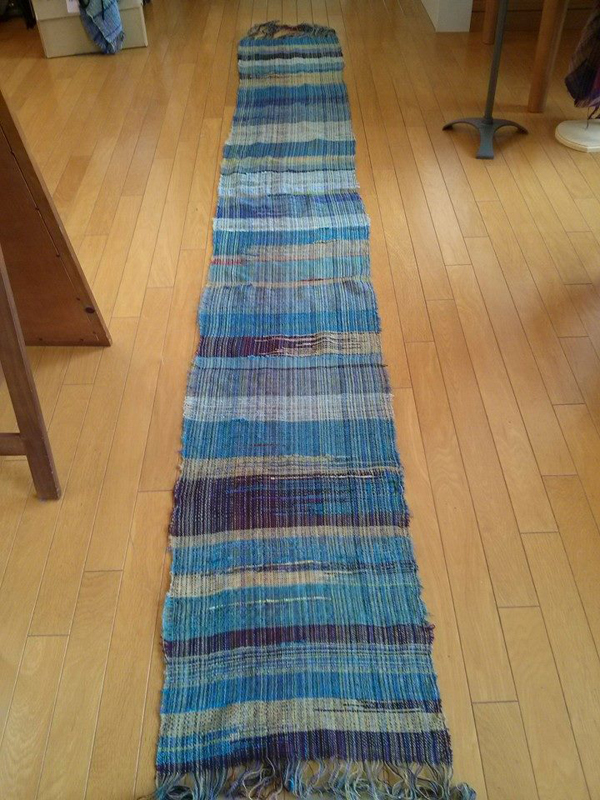 Then, it stayed in my studio until a few days before the SAORI Kai this past weekend. 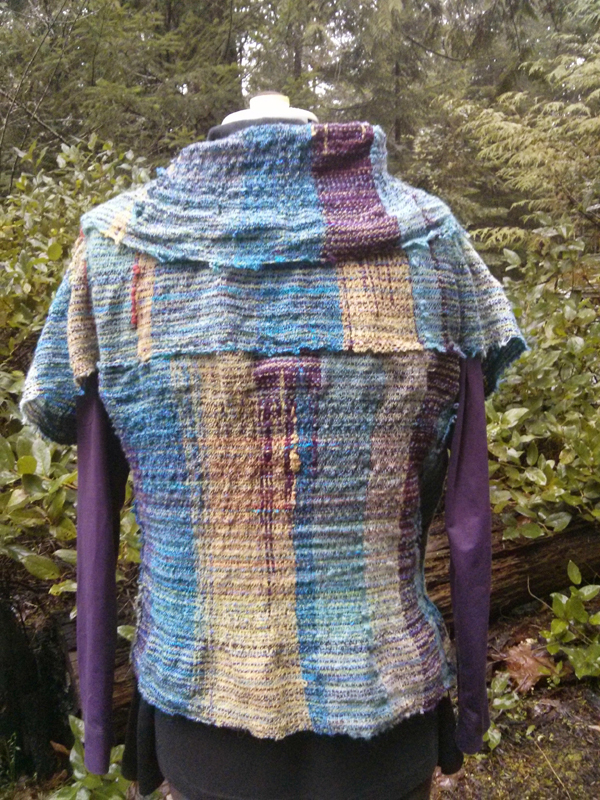 I needed something new to wear and so it was time for this piece to become a garment. 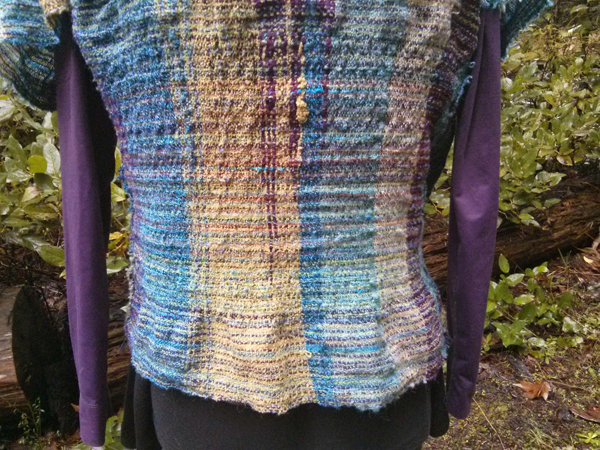 I wanted to feature the ruffles and so I made it into a vest, using the ruffles as a collar, the back yoke and as a feature at the bottom of the back of the vest. 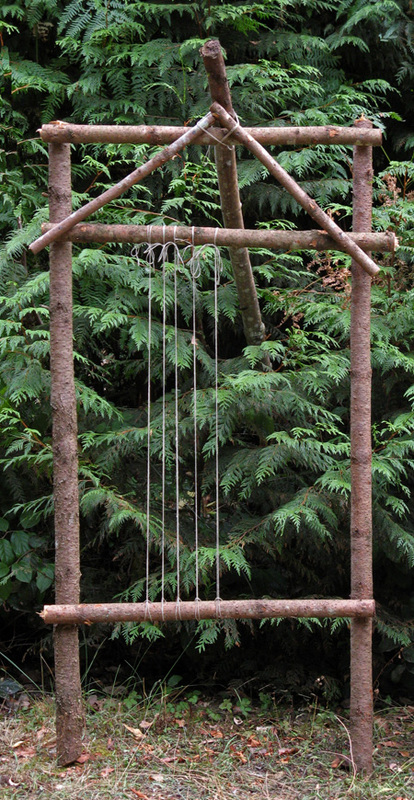 This was so simple to make as it is just two pieces. 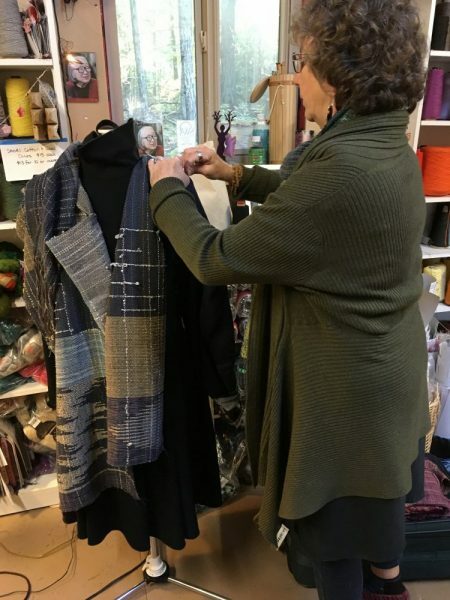 One piece is the entire front – from the bottom at one side, up and around the back becoming the collar and yoke, and then back down the other side. 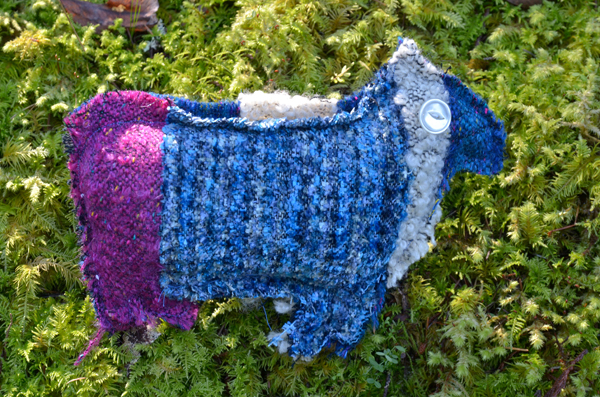 The back is a piece cut off and sewn to the yoke and the two sides. I sewed this all by hand. After I made it, I realized that it is similar in design to the vest in the Beginner’s Clothing Design book called the Rocket Vest (design #9). 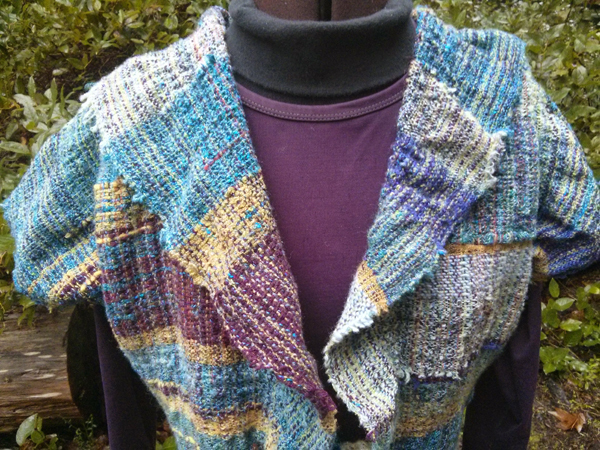 The vest is very lightweight, but warm as all the fibre is a very soft wool from SAORI Japan.